As things turned out, the first performance of the “whole thing”—Wagner’s four-part cycle, Der Ring des Nibelungen—did not take place until 1876. The orchestration of Siegfried was not completed until February of 1871, after one of the most troubling gestations in the history of music. It all started in the autumn of 1848, when Wagner wrote “The Nibelung Myth: As Sketch for a Drama,” a short plot outline based on his own reweaving of ancient Germanic and Norse myths. 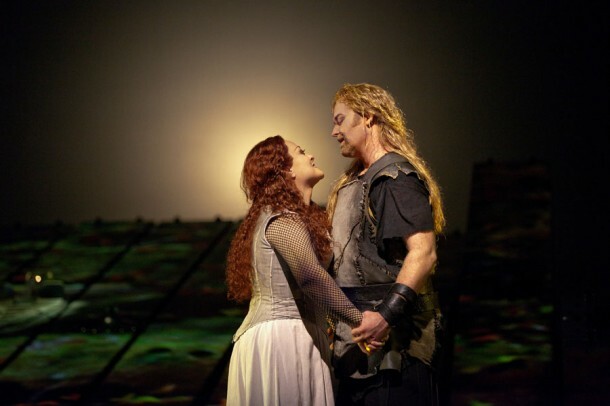 His tale of the rise and fall of the gods, the creation of the hero Siegfried (“the most perfect human being”), and Siegfried’s union with Brünnhilde eventually grew from one opera to four. By 1857 Wagner had completed the libretto to the entire work and composed the music to the first two operas, Das Rheingold and Die Walküre. It was a mad plan and, like many of Wagner’s attempts to make money, came to nothing. Wagner had not yet finished the prose sketch for Tristan, to say nothing of the actual libretto, or the music. His original idea “of leaving Siegfried alone in the forest for a year, in order to give myself some relief in writing a Tristan und Isolde” (as he told Ritter in July of 1857) eventually stretched to 12 years. During that time he not only finished Tristan, but revised his opera Tannhäuser for Paris and wrote Die Meistersinger von Nürnberg as well. Bavaria’s new king, Ludwig II, took the throne in 1864 and became Wagner’s patron. Wagner also began an affair with Liszt’s daughter Cosima while she was still married to the conductor Hans von Bülow. Wagner and Cosima eventually married, but not before setting off a major scandal in Munich that threatened his standing with the king. More than once during this chaotic 12-year hiatus, Wagner turned back to Siegfried, but it was not until February of 1869 that he “put the finishing strokes to the second act,” as he informed King Ludwig. By September he had completed the music to Act III, but to avoid having a performance of the work given in Munich (as had happened very much against his will to the first two operas in the Ring) he delayed finishing the orchestration until February of 1871, making excuse after excuse to the king. 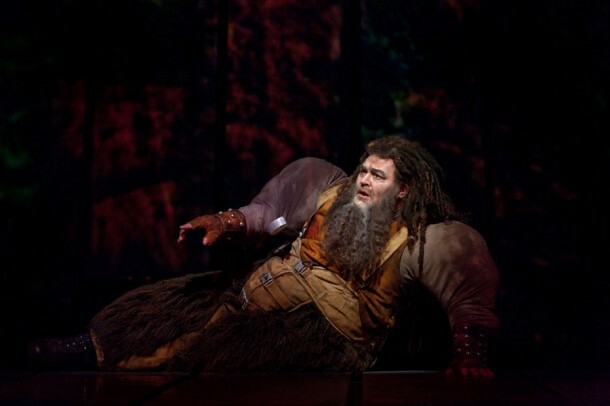 There are numerous logical “outer” reasons that kept Wagner from doing any significant work on Siegfried for 12 years, but more than likely the true reason for the postponement lay within Wagner himself. Deep in his psyche he undoubtedly realized that he needed to gain a more complete mastery of his compositional style before writing the music for the great confrontation between Siegfried and Wotan or Siegfried’s awakening of Brünnhilde. Of all the major characters in the Ring, Siegfried is probably the one who has been most misunderstood. Comedienne Anna Russell’s description (“He’s very young, and he’s very handsome, and he’s very strong, and he’s very brave, and he’s very stupid—he’s a regular Li’l Abner type”) is the one many operagoers have heard, but it is not accurate. Siegfried is not a badly socialized adult; he is a teenager—boisterous one minute, brooding and introspective the next. Emotionally he’s more on par with Cherubino in Mozart’s Le Nozze di Figaro or Octavian in Strauss’s Der Rosenkavalier than with Wagner’s Tristan or Siegmund. His only influence, other than nature itself (which he reveres) has been Mime, an evil, manipulative dwarf who plans to use Siegfried to kill Fafner and regain the Nibelung treasure. “Even speech I’d scarcely have mastered, had I not wrung it out of [you],” Siegfried tells him, which tells us just how caring Mime has been. Like most mythic heroes, Siegfried does not know his true parents, has never experienced their nurturing love, and has been forced to trust his own, inner instinct for survival. This instinct has made him hungry for knowledge, distrustful of Mime, and it is this instinct that leads him to file down the fragments of his father’s sword to re-forge it into his own, rather than trying to patch them together with solder as Mime has tried to do. “I’ve grown as old as cave and wood but never saw the like!” Mime mutters as he watches Siegfried at work. 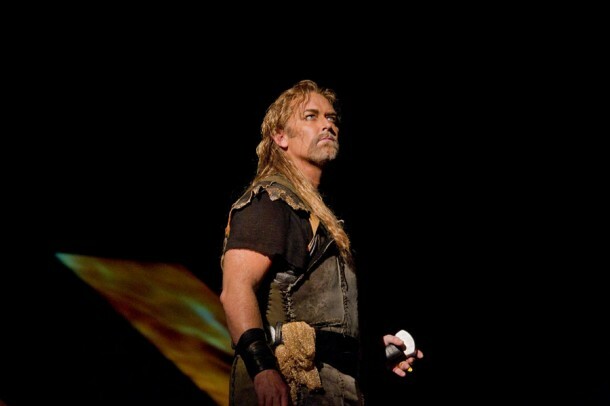 Psychologically it’s a masterstroke on Wagner’s part to show Siegfried forging his own manhood (of which the sword is a symbol) rather than simply accepting someone else’s sword (identity) and using it as his own, as his father, Siegmund, did in Die Walküre. 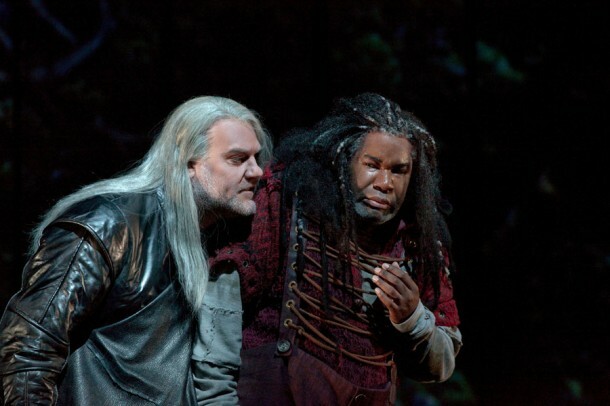 Siegmund simply accepted Wotan’s sword, so when he tried to use it in opposition to Wotan’s wishes, it broke. 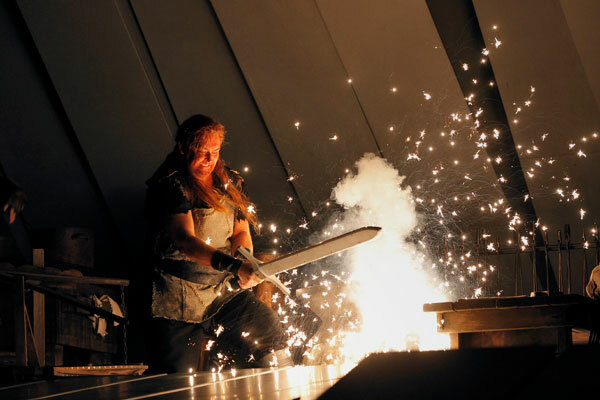 But when Siegfried uses it against the Wanderer in Act III, he is successful because the sword is no longer borrowed from Wotan—Siegfried has made it his own. He has become his own man, a hero. And that is why he can easily pass through the magical fire surrounding the sleeping Brünnhilde, awaken her, and claim her as his mate. For Siegfried’s exuberant Act I entrance and laughter Wagner wrote scampering eighth notes that eventually climb to a high C. But only a few minutes later Siegfried’s music is tender as he speaks of the birds in the forest, and it becomes filled with longing when he thinks of his mother’s death. At the moment Mime finally shows Siegfried the pieces of his father’s sword, Wagner tells us unmistakably what a significant moment this is: the very sound of the orchestra instantly becomes brighter. A listener does not need to intellectually know that the trumpet plays the musical motif associated with the sword and the strings counter with the motif representing Siegfried’s youthful strength in order to emotionally experience the great burst of energy and enthusiasm that explodes from the orchestra at that moment. It’s the perfect depiction of Siegfried suddenly understanding, deep inside, that this is what he needs to take the next step in life.